▲Students are shouting several slogans to guarantee the school's autonomy in front of Jogyesa Temple. On April 15th, 2016, the General Student Council and Student Council of Postgraduate held the 4.15 Jogye rally. The rally was also held in the last year with the same objectives. 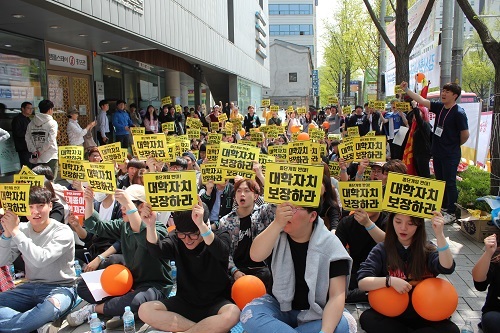 Goals of the rally are to criticize Jogye Order for its responsibility on Dongguk University’s present conflicts related to President Han Tae-sik (Bogwang) and to guarantee the school’s autonomy from the order. At 11:00 A.M., approximately 200 people, about 150 Donggukians and 50 people who are related to Dongguk University, gathered together in Manhae Hall. As soon as the march began, the marchers were obstructed by police officers because of a cow, which was prepared by the GSC, was not reported to participate in the rally. Scuffles broke out between the police and the GSC, and the cow was not able to go with the marchers. The parade was started from Chungmu-ro where Dongguk University is located, passed Myeong-dong and finally to Jogyesa Temple. After several speeches from students, the GSC and the gathered students tried to deliver request proposal to Jogye Order together, but police officers blocked the way. Therefore, only ten representatives were allowed to go to deliver the request proposal to the persons concerned of the Jogye Order at the temple gate. The request proposal involves following three demands: Jogye Order has to stop intervening in the school matters and should guarantee the school’s autonomy, every sunim who spoiled the school needs to apologize and resign, and board of directors should be reformed in a more democratic way.